Tucked within the beautiful Toe River Valley of Mitchell County, Spruce Pine, North Carolina, is a small Blue Ridge Mountain town convenient to some of the region’s most impressive peaks. The town itself is sandwiched in between the Pisgah National Forest to the south and the Cherokee National Forest to the north making this an ideal vacation spot for people looking to explore the region’s abundant natural beauty. Three of the areas most popular mountain peaks are all within an hour drive. Mt. Mitchell, Grandfather Mountain, and Roan Mountain offer a number of hiking trails, opportunities to spot wildlife and migratory bird species, and the most breathtaking views of the Blue Ridge. The Blue Ridge Parkway, considered America’s favorite drive, passes through this area offering some stunning vantage points of the surrounding mountains. While exploring the scenic overlooks be sure to drop by the The Orchard at Altapass for a U-Pick adventure. They offer hiking trails and family hayrides, live music, arts, crafts, and, of course, delicious heirloom apples. Closer to town, the Toe River provides ample recreation from lazy river tubing to kayaking to fly-fishing. There are a number of guided fly-fishing expeditions you can take along the river. Discover the best fishing holes, or learn the basics of fly-fishing with Southern Appalachian Anglers, or Burnsville Anglers. The downtown area is comprised of two main streets, Oak Ave. and Locus St., which run parallel to each other. Each is lined with shops, boutiques, bookstores, gem shops, and restaurants. 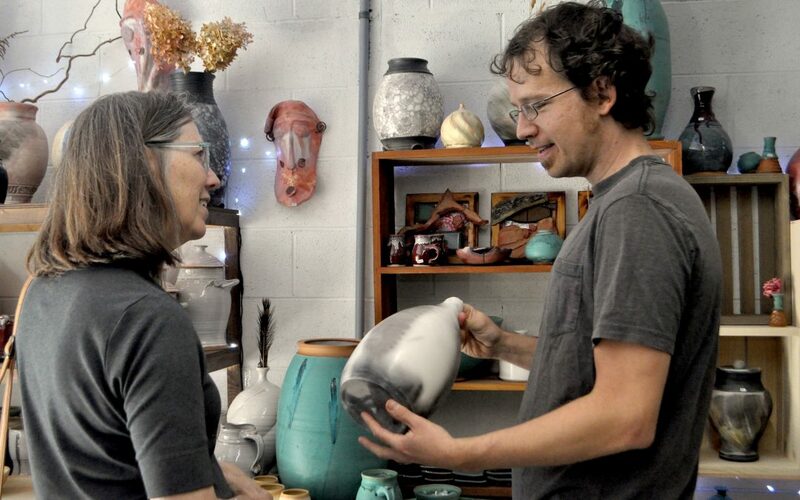 The art scene is big in Spruce Pine. Home to the Toe River Arts Council, their gallery on Oak Ave. boasts some of the best art from the region. 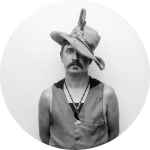 With the famed Penland School of Crafts located just down the road in nearby Bakersville, the artwork found in this gallery is remarkable so it’s definitely worth the visit. 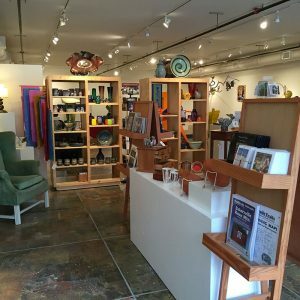 Just outside of Spruce Pine in Micaville, the One Of A Kind Art Gallery is located in the town’s former general store and features the works of 150 local artists and craftspeople. South of downtown you’ll find more shops like The Blue Ridge Soap Shed where they make over 150 different types of soap from scratch. Before heading out into the forest to go hiking or camping, drop by this place and pick up one of their soaps for the outdoors. They have soaps that repel bugs, relieve poison ivy rash, assist with scrubbing cookware to prevent bears and other critters from bothering your campsite, and a soap that disguises human scene from fish and wildlife. 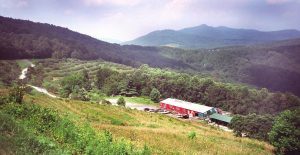 For the kids (and adult kids), this area boasts a large number of gem mines like the Gem Mountain Gemstone Mine, which is located one mile off the Blue Ridge Parkway. This family-friendly spot has covered flumes so you can prospect for valuable gems in rain or shine. They also conduct mine tours, but you’ll want to call ahead and make a reservation. 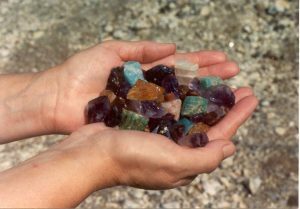 You’ll get to explore Brushy Creek Mine and Hoot Owl Mine where they source the gems used in their flumes. Another great spot for gem mining is Emerald Village. With a setting that recreates how an old mining town looked, they offer a cool nighttime Black Light mine tour, and opportunities to pan for gold, beautiful gems, and minerals. The Linville Caverns offer your family the chance to explore deep inside Humpback Mountain. Home to unusual stalactites, stalagmites, and a number of native wildlife species, this is one of the coolest tours in the region, and the only show cavern in the mountains. Each year the streets come alive in Spruce Pine celebrating everything from North Carolina Barbecue to Fine Art. Here’s a list of some of the most popular events. The Skyline Village Inn is a cool spot located right off the Blue Ridge Parkway, and very close to the Little Switzerland community. The Inn is located on the side of a mountain next to a cavern used by moonshiners back in the day. You can also rent motorcycles from the Inn to explore the back roads of the mountains. The Big Lynn Lodge is also nearby with a community of cute cottages to rent for the evening. The views here are spectacular and they have a restaurant on site overlooking the mountain vistas. There are a number of campgrounds throughout the valley as well. Bear Den Family Campground, Springmaid Mountain Resort, the Spruce Pine Campground, and many more are all located within a short drive to downtown Spruce Pine.